Zach Collins is an American professional Basketball player who plays in the National Basketball Association (NBA). Zach Collins currently plays for the Portland Trail Blazers as their Power forward / Center as of 2019. As a Power forward / Center, Zach Collins earns around $3,642,120 as his yearly salary from Portland Trail Blazers. Further, Zach Collins has an estimated net worth of over $2 million. Currently, Collins is dating his girlfriend Angelica Payne but they haven't disclosed if they are to marry soon. 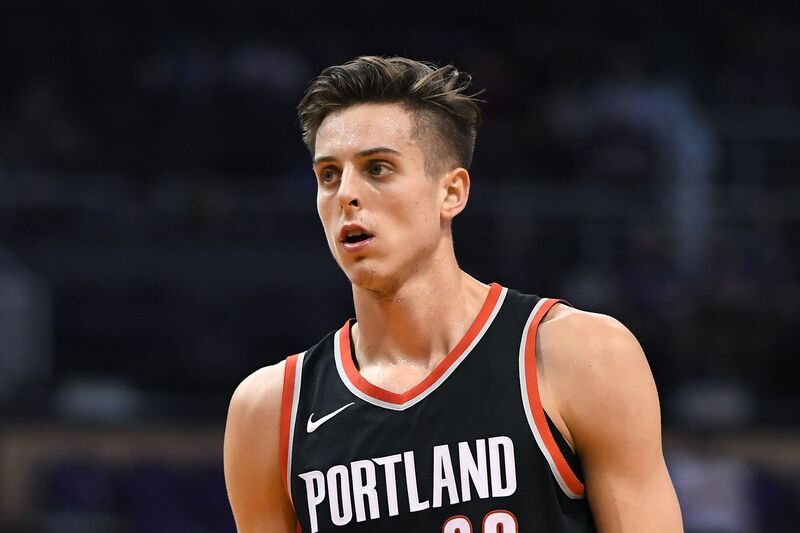 What's Zach Collins Net Worth And Salary in 2019? The Portland Trail Blazers' Power forward / Cente, Zach Collins has an estimated net worth of over $2 million as of 2019. He reportedly signed a 3-year contract with Portland Trail Blazers in 2017. So, as per the penned contract, Zach Collins average salary is $3,642,120 per annum, including $10,926,360 guaranteed. In the 2018-19 season, Collins will earn a basic salary of $3,628,920, with a cap hit of $3,628,920 and a dead cap value of $7,869,120. Zach Collins so far has made earnings of $6,686,160 from his entire NBA career. In addition, he is the 8th best-paid player of Portland Trail Blazers while Damian Lillard, CJ McCollum, Evan Turner are among the highest paid players. He will reportedly earn $4,240,200 in 2019/2020 season. Back in 2017, Zach purchased his first car. Zach Collin is currently in a relationship with his girlfriend named Angelica Payne. Both the couple attended Bishop Gorman High school where Angelica was also a member of a cheerleading squad in her High School in Las Vegas. Further, she is currently studying at UCLA. The Famous NBA star is 7 feet in height and weighs around 107 kg. Other than being a famous NBA Power forward / Center, Zach Collins is pretty famous in social media and is often seen uploading contents for his followers. Zach Collins was born on November 19, 1997, in North Las Vegas, Nevada to parents Michael Collins and Heather Collins. As per his nationality, he is American and belongs to a white ethnic group. Further, his star sign is Scorpio. In addition, the details about his siblings are not available yet. Zach Collins attended Bishop Gorman High School in Las Vegas, Nevada where he played for his high school basketball team. Zach Collins, in his high school career, held an average of 17.3 points and 14 rebounds as a senior. After completing high school, Zach Collins enrolled at Gonzaga University and played for the Gonzaga Bulldogs. At the end of his freshman season, Collins announced for 2017 NBA draft. He was drafted in 10th place by the Sacramento Kings and then traded to the Portland Trail Blazers and eventually signed for Trail Blazers on July 3, 2017. Collins wears a jersey no 33, playing along with his star teammates like Jusuf Nurkic, Maurice Harkless, Meyers Leonard.